Amazing Jaguar Bass Set for Budding Bass Players Ideal for beginning bass players, the Squier Stop Dreaming, Start Playing! Set: Affinity Series Jaguar Bass Special SS with Fender Rumble 15 Amp is your A-Z bass package. The Squier Affinity Jaguar Bass Special SS offers both P Bass and J Bass single-coil pickups, delivering an incredible range of classic bass tone. Its short-scale neck and narrow fretboard are also perfect for players with smaller hands. It's paired with a 1 x 8" Fender Rumble 15 combo bass amp - a perfect practice amp with a stereo aux input and a headphone out for silent practice. Top it off with a complete accessories package, and this Squire Affinity Series Jaguar Bass set is an excellent deal. Based on Fender's popular Jaguar Bass, this Squier Affinity Series Jaguar Bass Special SS is a hybrid of classic Jaguar, Precision, and Jazz Bass models that's ideal for beginning bass players. For starters, it's 30" short-scale neck and narrow fretboard (just 1.5" at the nut) are ideal for small hands and just plain comfortable when you're putting in the hours to develop your chops. At the same time, the combination of a P Bass split pickup and a J Bass bridge pickup delivers a massive range of single-coil tone, which you can dial in via independent volume controls. With its fast action and extended tone, this Jaguar Bass Special SS in an all around fantastic bass. 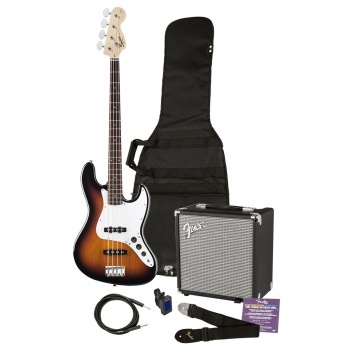 Package includes tuner, cable, strap, gig bag, and instructional DVD Lean to play bass with the Squier Stop Dreaming, Start Playing! Set: Affinity Series Jaguar Bass Special SS with Fender Rumble 15 Amp!